It’s easy to get spoiled as a perfume enthusiast. After smelling your way through niche lines, you may not even bother with department store offerings unless they’re by Hermès or Chanel or have been getting special attention by tastemakers. Before long, you might find you’ve become like the gourmet who complains about the overly dry truffles in his scrambled eggs, forgetting how many people can’t even scrape together the money for a bowl of oatmeal. Please keep this in mind as I tell you that neither Parfums MDCI Cuir Garamante nor Nuit Andalouse tempted me. Nose Richard Ibanez composed Cuir Garamante. Its notes feature pink pepper, nutmeg, saffron, rose, oud accord, papyrus, leather, vanilla, labdanum, incense and sandalwood. Once the tingly top of Cuir Garamante wears down, a thick, funky leather with a touch of sweetness emerges — for about ten minutes. Then it’s as if the perfumer stood, hands on hips, in his lab and said, “What manly notes can I toss in?” Into the pot went every assertive note he could find (including what smells to me like a helping of pipe tobacco) to duke it out over the fragrance’s next few hours on skin. The leather is vanquished early on, and oud comes out on top. Despite the mish-mash, Cuir Garamante doesn’t have a lot of sharp edges. Imagine something macho but refined, like Rocky Balboa, fresh from the ring, in a tuxedo. While that should sound interesting — I love a good high-low mix as much as anyone — I’m not sure it was intended, and I can’t quite get my head around what’s going on in this perfume. Cuir Garamante lasts a good five hours on my skin, and it has robust sillage even dabbed from a sample vial. If Cuir Garamante is macho, Nuit Andalouse is pure femininity. Cécile Zarokian developed Nuit Andalouse, and its notes include violet, orange flower, orange, gardenia, green notes, ylang ylang, rose, sandalwood, musk and salicylates. I smell moss, too. Nuit Andalouse is a silky, entrancing gardenia with the enveloping texture of a down comforter — a down comforter tumbled with a dryer sheet, that is. Nuit Andalouse (what a gorgeous name!) is a smoothly whipped bouquet of the softest, most velvety flowers. Its gardenia isn’t strident or sickly-fruity or buzzy. It’s calmed by summer flowers and as gentle as a breeze on a warm night. What stops the fragrance from seducing me completely is a slug of clean musk that reminds me too much of drugstore shampoo. Despite being so soft, Nuit Andalouse lasts all day on my skin and has moderate sillage. Sure, I’d rather wear either of these fragrances than 99% of what’s on the shelf at Macy’s. But for the same money I’d choose other leather or gardenia fragrances or another perfume from the Parfums MDCI line. (Chypre Palatin and Enlèvement au Sérail are on my “when my ship comes in” list.) On the bright side, since I’m not wild about either Cuir Garamante or Nuit Andalouse, I’ve saved myself some serious money. Maybe I won’t have to count my pennies for that oatmeal after all. Parfums MDCI Cuir Garamante and Nuit Andalouse Eau de Parfum are each $250 for 75 ml, or $375 for the bottle with the resin bust. For information on where to buy them, see Parfums MDCI under Perfume Houses. The notes from Nuit Andalouse does sound appealing. I love the bottle. And, this must be the season of fragrances to have tassels on them. I love that look. Angela, you are so right about the niche perfumes. I don’t even like getting my fragrances from department stores anymore. For me, I am growing into a true perfumista. 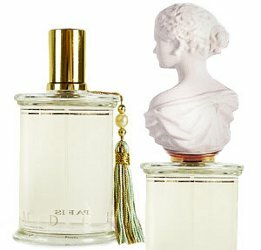 Every once in a while something really wonderful shows up at the department store, but there are so many good niche fragrances that it’s hard to keep up! Your truffles were dry too? I’m going to fire the chef! Really, I don’t think there is any danger of being hyper-critical when one is talking about a perfume in this price range. Presumably one must be in a total swoon to want anything in this price range. In fact, I try steel myself to ensure I won’t be in a swoon… Nevertheless, if a scent did catapult me into the upper reaches of ecstasy, I would consider it. Do I dare to try Isabey’s L’ambre de carthage again? You’re absolutely right–at a certain price point, a perfume must make your heart race in delight. Often I’m happy when I don’t like an expensive perfume! As for L’Ambre de Carthage, how brave are you feeling? Or maybe I should have said, How rich are you feeling? Your review confirms my suspicions about many niche releases. I can’t see why prices like that can be demanded for a fragrance that panders to the mainstream love of laundry musk. I’m left to assume, cynically, that the target market must be people with more money than taste. Your choices are a lot better than oatmeal, that’s for sure! I could happily live with them all. Don’t even get me started on the “more money than taste” angle. Sometimes I even think money corrupts taste. An oatmeal budget really hones the senses. Yes, it is a very helpful thing. I mean, consider Dioressence against many niche offerings in the last few years. Nuff said. I love old Dioressence, but I haven’t smelled the very latest Dioressence–I think my bottle is 4 or 5 years old. It’s fine, but I like the older stuff in the metal canister better. I tried both of these from sample vials. I did not like Cuir Garamonte. I thought Nuit Andalouse VERY pretty and planned to try it again and possibly get a decant. FYI, I have decants of Chype Palatin and Enlevement au Serail, so I agree with you that those are great. Might have bought Enlevement had I not bought HdP 1969 first, which is a bit similar and less expensive. I forget exactly but I think it went for less than the price of the plain bottle. What I try to remind myself in these cases is that if I HAD bid on it, then obviously the price would have gone up, and it would not have been such a bargain for me as it was for the person whom I chose not to compete with. But that’s too convoluted to assuage the ebay magpie part of my brain. Nuit Andalouse sounds tempting. Then I read “salicylates”. These are a major trigger for headaches and allergic reactions in some people. It’s also why I can’t tolerate aspirin. A sigh of regret from me, coupled with a sigh of relief from my pocketbook. Try the “Irish”oatmeal or long cooking kind; add a bit of vanilla or almond extract. (I assume anyone reading this blog appreciates vanilla). Oh, sorry back to perfume. Some niches are better than others. Chypre Palatan is really good, about as close to an old fashioned chypre as a you are going to find in these anti oak-moss days. Have you ever tried soaking steel cut oats all night, then cooking them in the morning? I’ve been meaning to try it. I like oatmeal, too–and I really like cooked mixed grains in the morning. To me, though, the champion breakfast is a thick slice of toasted spelt bread with a poached egg on top from a pasture-raised hen. Sometimes I’ll smash a slice or two of avocado on the toast. Delicious. Steel cut oatmeal is da bomb, especially with a few chopped nuts tossed in. Maybe some cinnamon too. I didn’t bother with Cuir Garamante as it sounded too masculine for my taste. I did try Nuit Andalouse, and thought it was really lovely but close enough to other soft mixed white floral fragrances I already own that I wasn’t very tempted. Particularly, as you point out, at that price. Yes, nuts in oatmeal are delicious!